Le Moulin Charmant is a beautifully converted mid-nineteenth century mill house bordering the Auvezere river just outside Hautefort in the Dordogne. Le Moulin Charmant is a beautifully converted mid-nineteenth century mill house bordering the Auvezere river just outside Hautefort in the Dordogne. It stands within 4 hectares of grounds and gardens in stunning countryside dotted with historic towns and villages. This impressive conversion has resulted in a charming and beautiful home full of beautiful, personal touches, perfectly combining comfort and style. It offers a large traditional, well-equipped kitchen with dining table and spacious sitting area. In addition, there is a wonderful covered terrace ideal for BBQs and outdoor eating. There is also a cozy sitting room with huge log burning stove and a large barn is attached to the end of the Mill, with table tennis and plenty of room for fun and games. The Mill has a gated and heated outdoor swimming pool with charming pool house with balcony. To make your stay both memorable and more relaxing the non-resident English speaking housekeeper is available to arrange additional services such as Cordon Bleu meals, a fridge stocking service, hampers, babysitting and maid service. Complimentary White Company soaps are provided in the bathrooms. 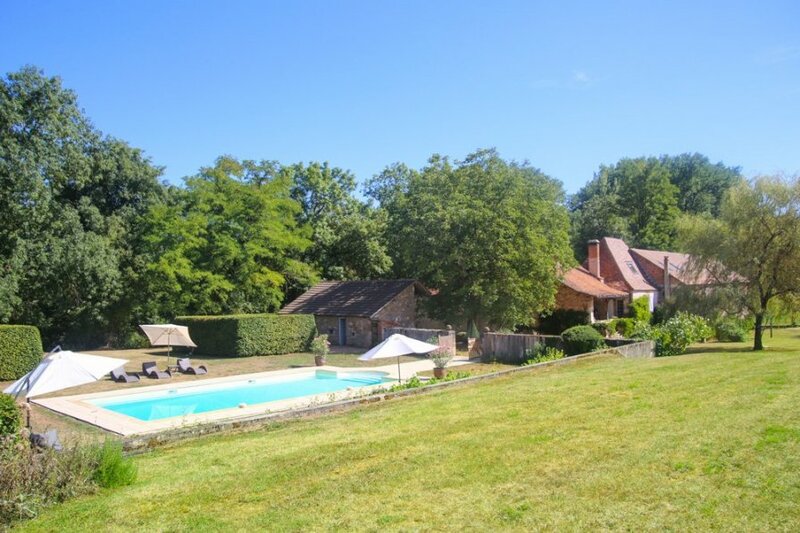 Located in the outskirts of the gorgeous traditional village of Toirtourac and just a few minutes drive from the lively town of Hautefort with a delicious boulangerie, a restaurant and bar as well as sport facilities, the Chateau is the perfect base to explore the beautiful Dordogne region. 6th Bedroom: single bed and separate W.C.
Table tennis, boules, darts, croquet etc. Just 3 km away is the village of Toirtourac, with its beautiful monastery, restaurant and bar, charcuterie shop and an award winning boulangerie. The magnificent Chateau and town of Hautefort is 6 km away and also offers charming restaurants, bars and shops as well as all-weather tennis courts which are free to the public. Many of the local towns have charming weekly markets. Le Moulin Charmant is just over an hour's drive from Bergerac Airport and Limoges Airport. Bordeaux Airport is two hours away. Upon arrival, you will be provided with all the necessary information regarding the local area including arranging bike hire, a useful and fun way to explore the French countryside and the surrounding villages.